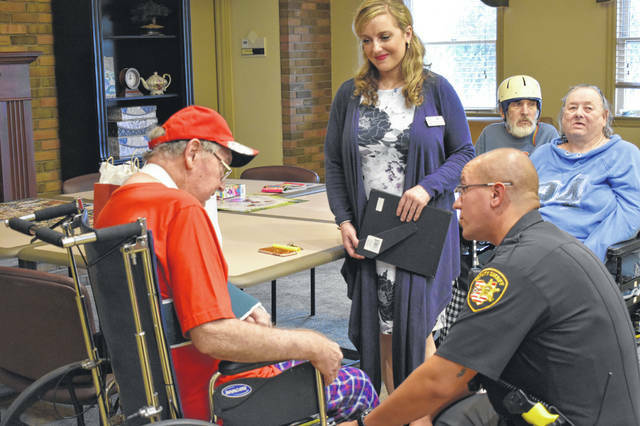 Delaware County Sheriff’s Deputy John Hicks speaks to U.S. Army veteran Ed Berwinkle Tuesday afternoon at the Country Club Rehabilitation Campus. Hicks spoke to and thanked several veterans for their service Tuesday to commemorate Patriot Day. Hicks gives a “thank you” card to U.S. Army veteran John Sipes Tuesday afternoon. Sipes told Hicks about his 12 year career in the army and thanked Hicks for coming to visit. 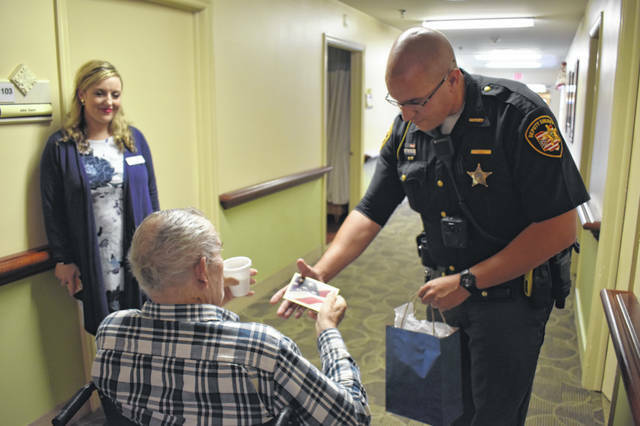 To commemorate Patriot Day, the Delaware County Sheriff’s Office sent a deputy to speak and give a gift to veterans currently living at Country Club Rehabilitation Campus at 478 S. Sandusky St., Delaware. Deputy John Hicks said it was an honor to speak to the veterans at the facility on Tuesday, Sept. 11. Hicks went room to room and spoke to several veterans and thanked them for their service before giving them a small token of appreciation, which included a card, a flashlight and an American flag hat. John Sipes, a U.S. Army veteran, thanked Hicks for coming and told him about his 12 year career in the army. “I only earned three stripes,” Sipes laughed. Sipes added he got offered a promotion if he re-upped, but he turned it down. Sipes told Hicks that his son served 22 years in the Army and got stationed in Alaska. Amy Howerton, a licensed nursing home administrator, said she believed the visit was a great way to honor the residents who are veterans. Hicks also spoke to Sandy Abels, a woman who served 23 years in the U.S. Navy. Hicks asked her questions about her time in the Navy and learned that she joined, in part, because the previous four generations of her family also served in the Navy. Hicks spoke to several other veterans Tuesday afternoon before returning to road patrol. Hicks added he enjoyed his experience.